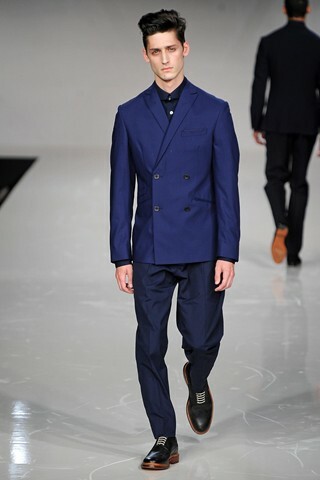 Instead of opting for a runway show or a traditional showroom presentation, Italian menswear label Brioni decided to take its sartorial talent outside and reveal its Spring/Summer 2013 collection in the lush gardens of Milan’s La Triennale. Inspired by American photographer Slim Aarons’s motto of “photographing attractive people doing attractive things in attractive places”, the presentation of the collection attempted to create portraits of men unwinding on a balmy Sunday at their favourite club, in cosmopolitan resorts with live jazz drifting in the air, enjoying a picnic amidst nature, or playing outdoors sports such a badminton or croquet. The collection relies on bright colours such as fire-engine red and sun-kissed yellows and ochre that evoke the Tuscan countryside in Summer, juxtaposed with water colour hues, from aqua to ocean blue. 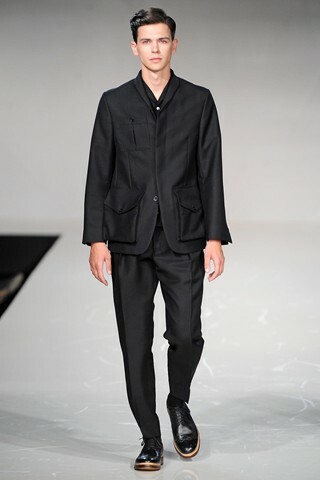 Shapes include the ‘Jardigan’, one of Brioni’s key pieces for Spring/Summer 2013: this is a garment envisioned as a modern rendition of a mid-1950s archival piece that envelopes the body like a jacket but with the ease of a cardigan fashioned from fine wool crepe. 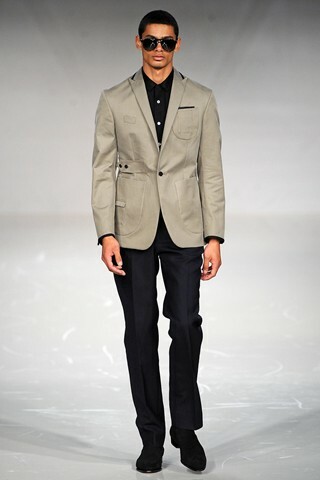 Another example of light-weight clothing comes in the form of an unlined blazer, whereas denim is mixed with an interlock of blue and white linen to create a slim two-button suit. 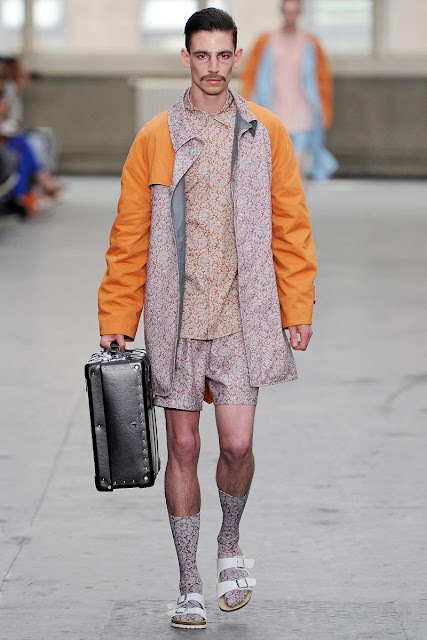 On the accessories front, a hand-entwined weave is carried out on looms with leather strips in two different colours in duffel and weekend bags, small leather goods and limited-edition lace up shoes. 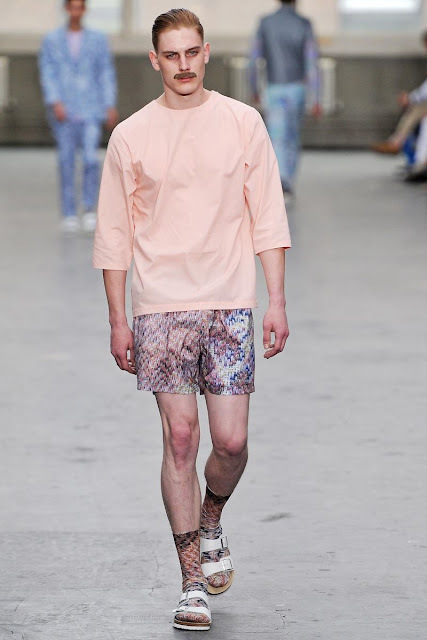 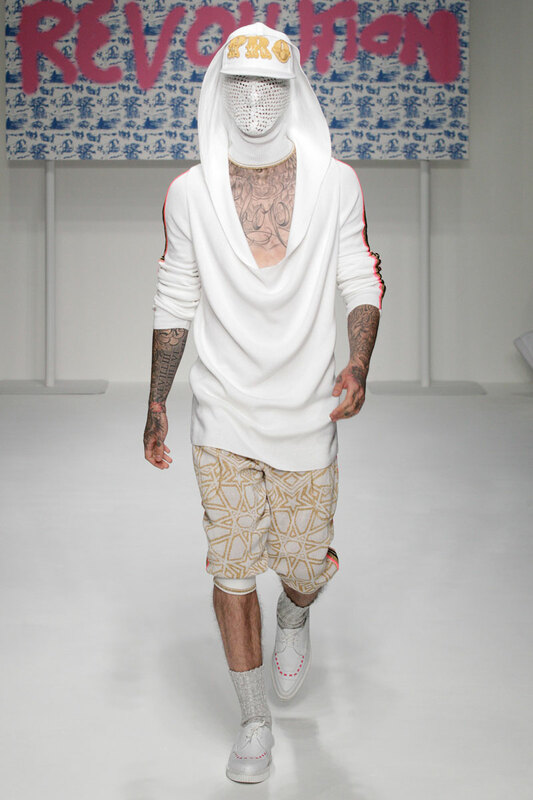 The collection is complemented by a range of beach towels and matching swimming trunks. 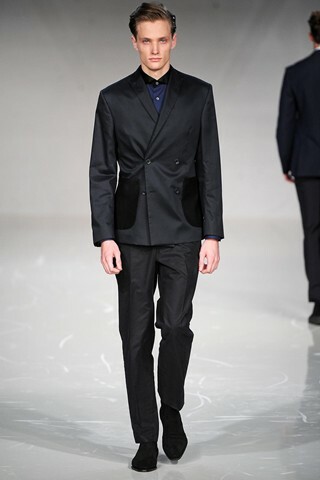 After showing for two seasons during London Fashion Week as part of the Fashion East installations, Agape Mdumulla and Sam Cotton showed their inaugural runway collection for Autumn/Winter 2012 as part of MAN (a collaborative project between Topman and Fashion East) in the sombre environs of London's Royal Opera House back in February 2012. 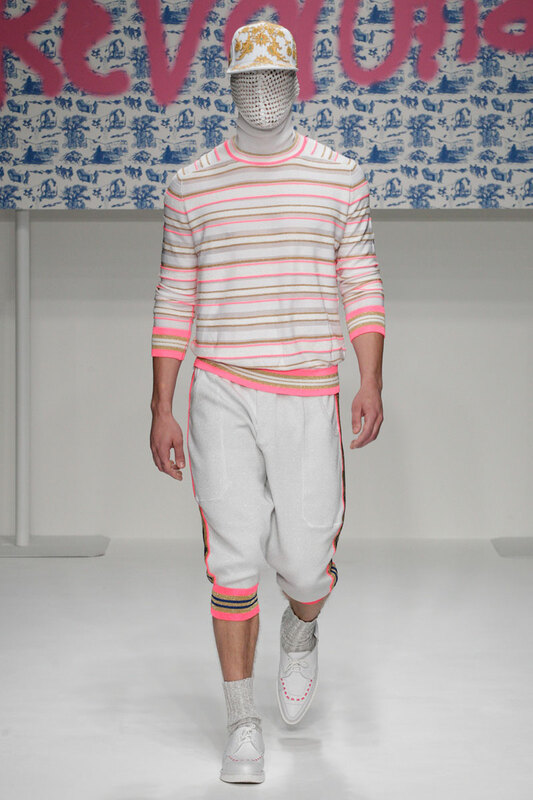 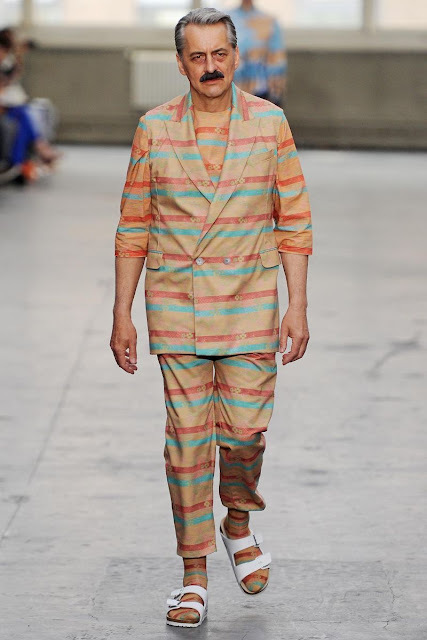 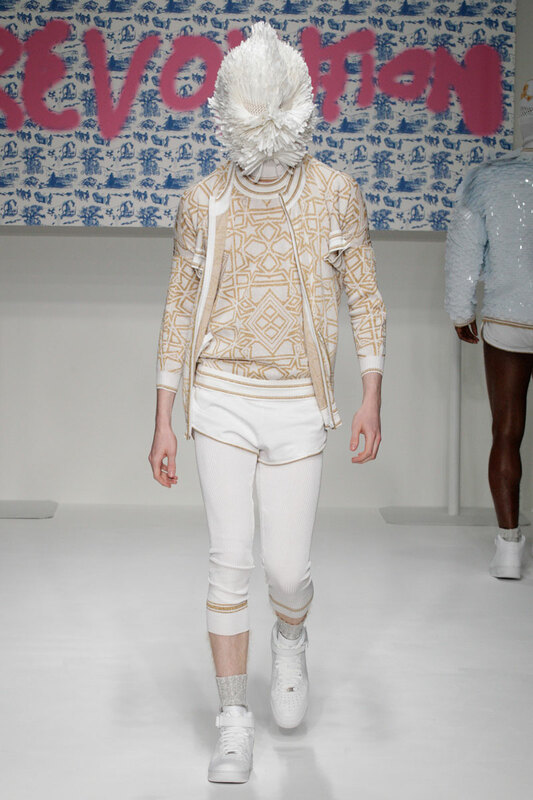 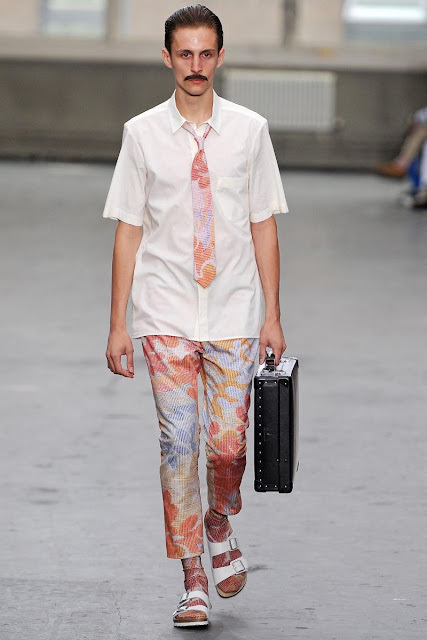 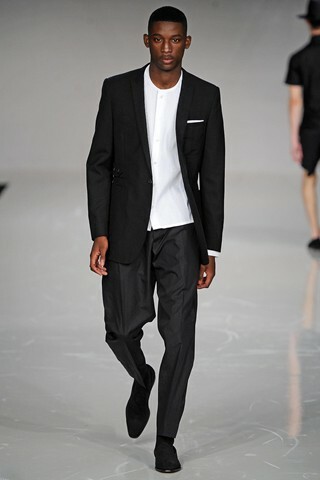 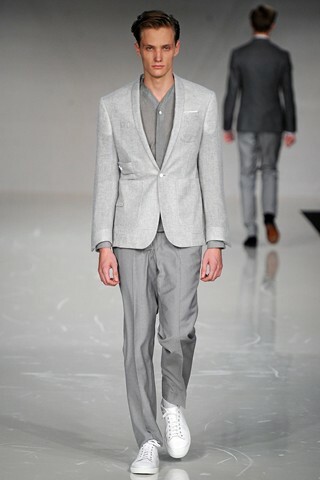 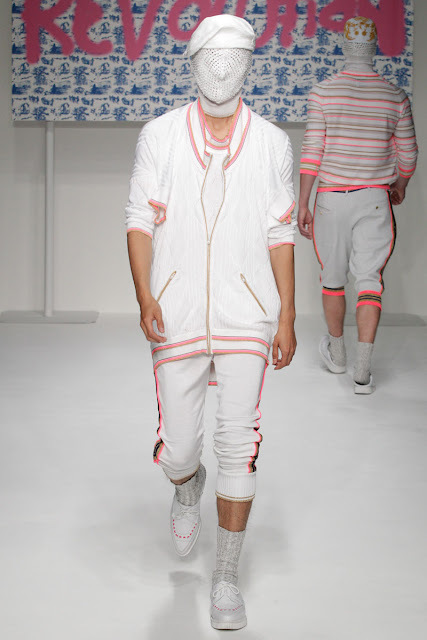 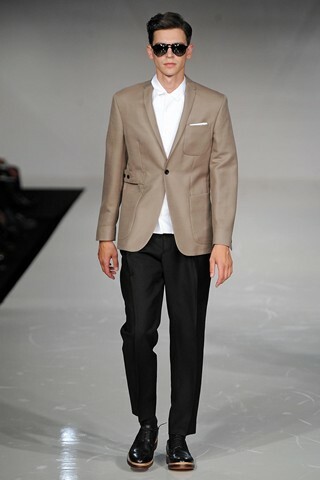 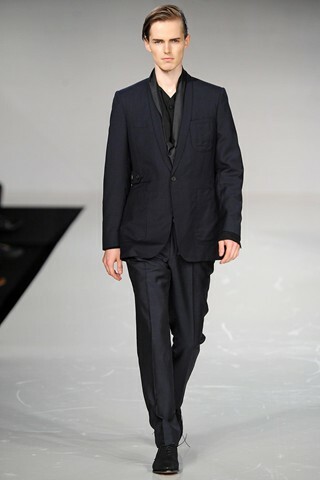 The Style Examiner found that collection incredibly enchanting (see review HERE) and very much looked forward to Agi & Sam’s return to the MAN runway for Spring/Summer 2013. 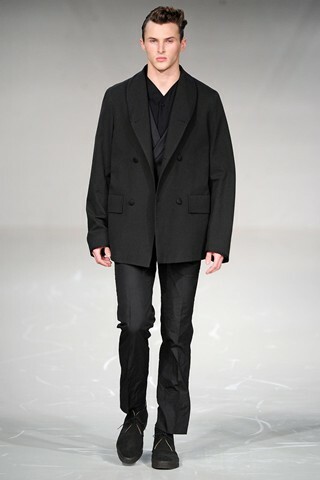 Suffice to say that the duo's latest collection was far from disappointing and confirmed that Agi & Sam is one of the most exciting London labels currently designing and producing clothes for men. 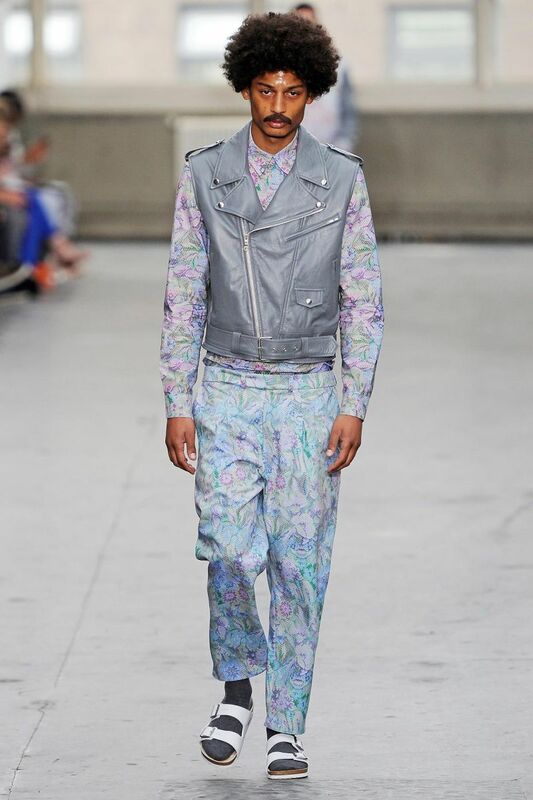 Inspired by memories of being made to watch 1980s television detective series in their grand-parents’ homes, Agi & Sam devised a collection that explored modern menswear silhouettes against prints with exaggerated florals, pastel upholstery patterns, and needlepoint embroidery printed as trompe l’oeil designs onto the fabrics. The young designers also continued their investigation into the potential of fabric, once again using cloth made from recycled plastic soft drinks bottles as well as more traditional fabrics such as jersey, cotton and leather. 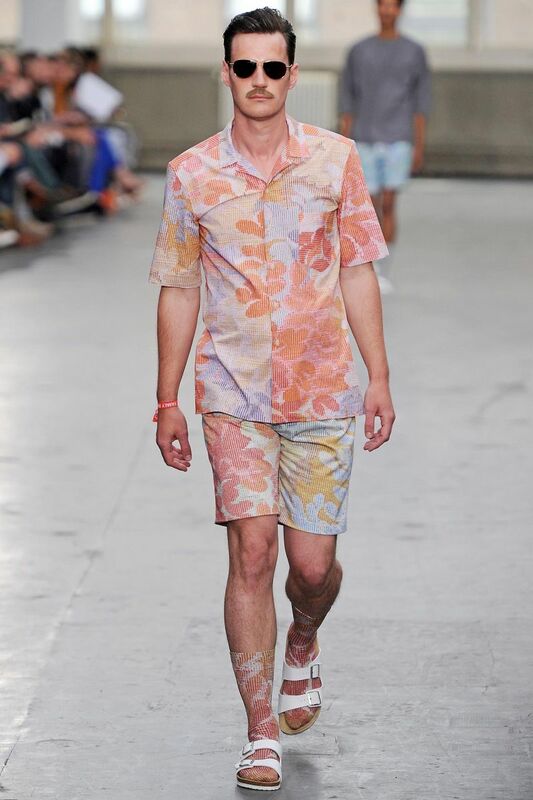 Moustachioed models (inspired by the exaggerated masculinity embodied by fictional male characters in TV series such as Magnum P.I. 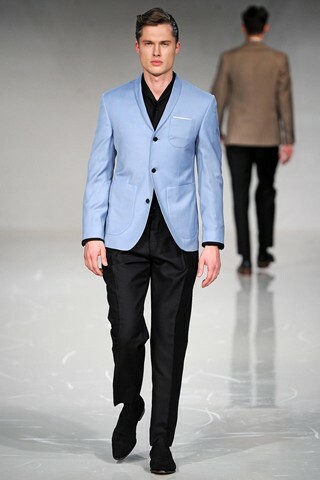 and Miami Vice) wore tailored blazers and trench coats in relaxed shapes mixed with casual garments such as biker jackets, and with sportswear-inspired pieces such as tracksuits and swimming shorts. The playful and elegant bold print element continued throughout the collection in the form of matching printed socks developed in collaboration with Japanese company Tabio. After the show, Sam confessed to The Style Examiner that designing this collection was very much of a challenge, as the duo had only been allowed a three-month window to design and produce the printed fabrics and assemble the garments. 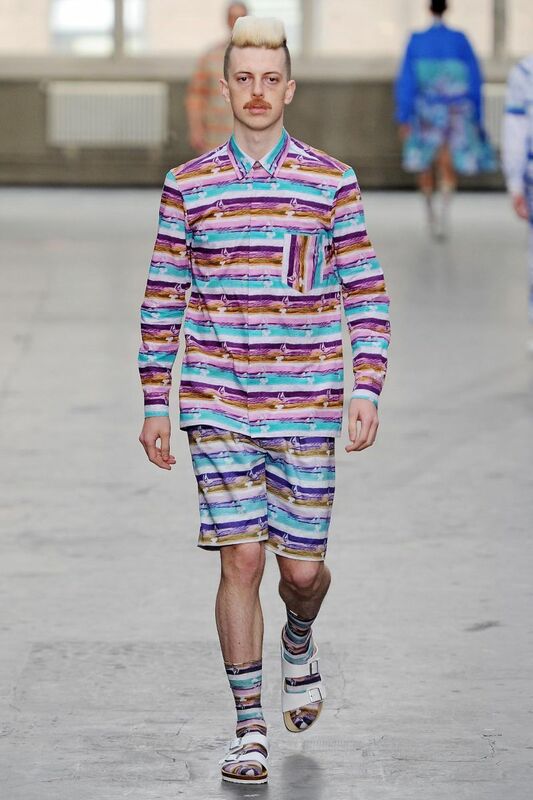 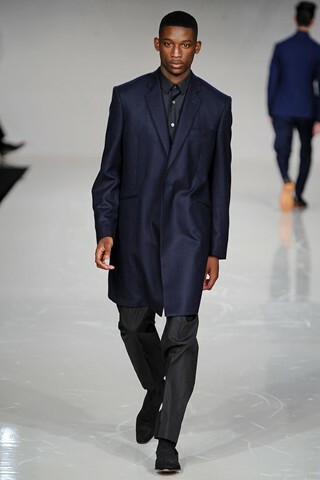 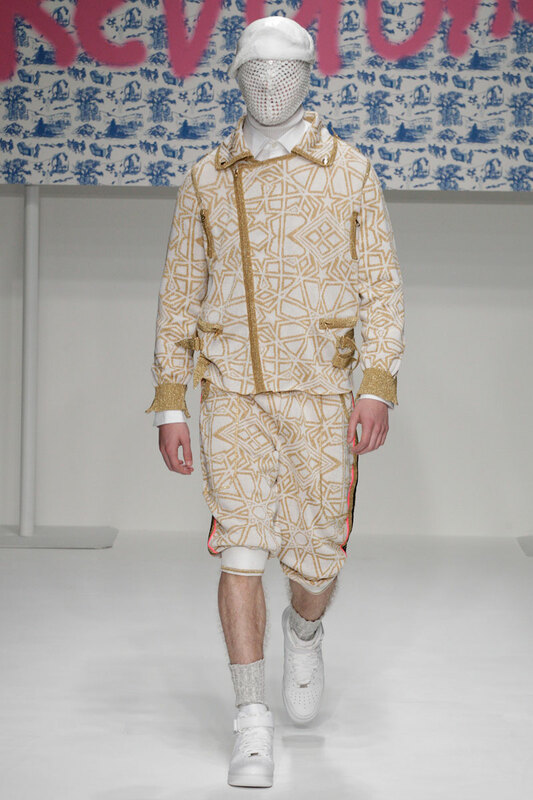 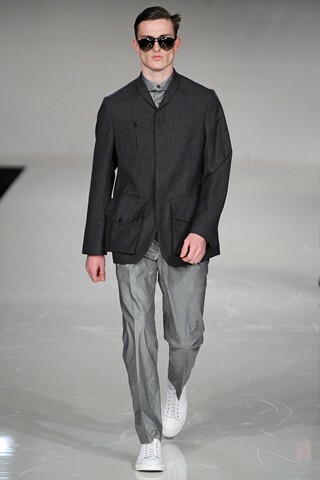 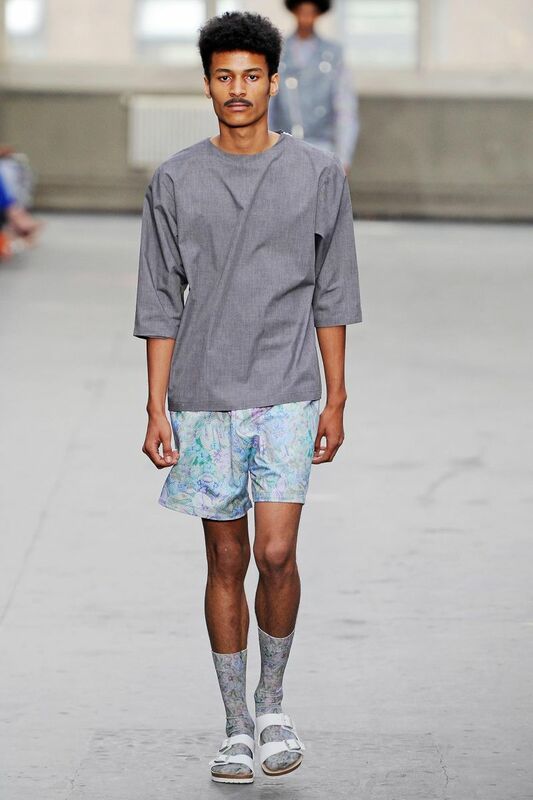 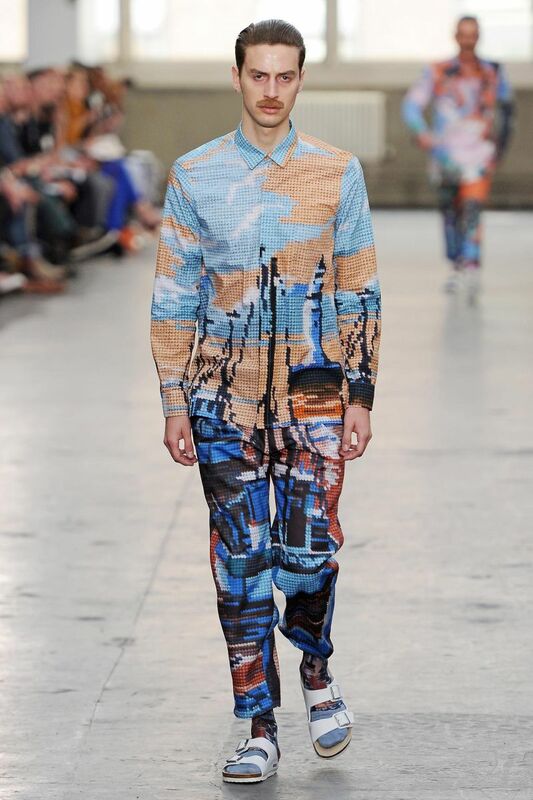 However, this was a collection that was not short of creativity and technical accomplishment, cementing Agi & Sam’s reputation as one of the most promising new menswear labels in London. 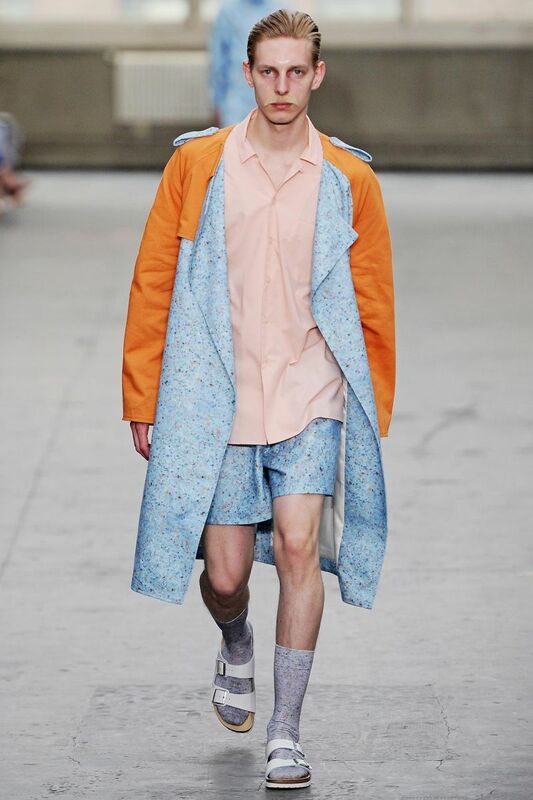 Established in 2008, Sibling has slowly but surely secured a cult status amongst fashion followers not only in London but internationally, with their collections stocked in retailers in Belgium, France, Hong Kong, Japan, Korea, Russia and Saudi Arabia. 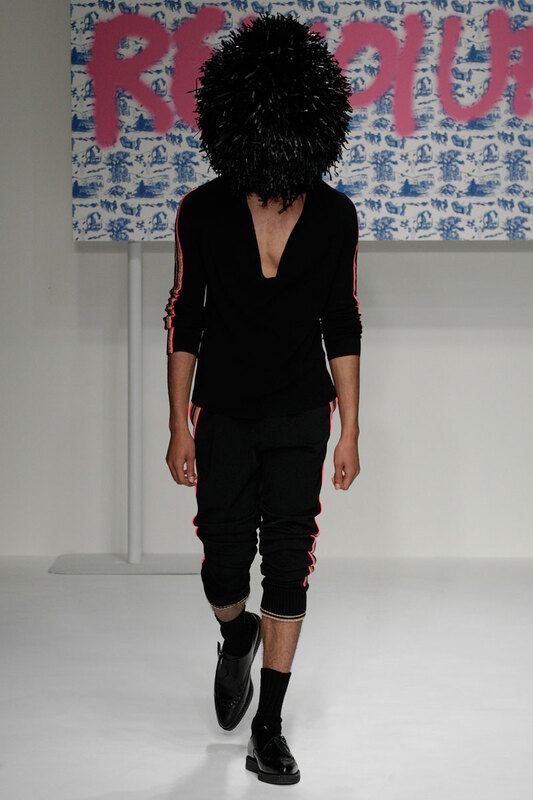 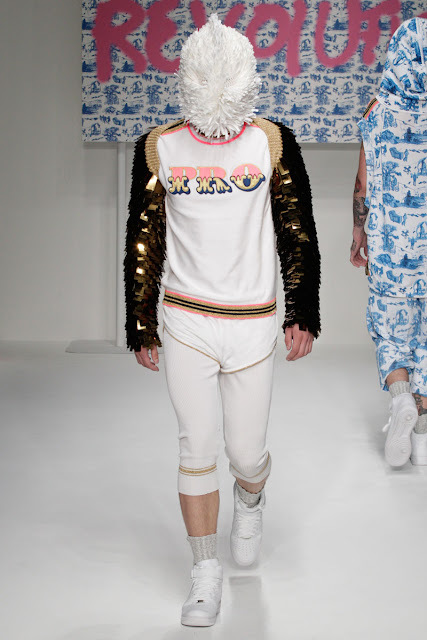 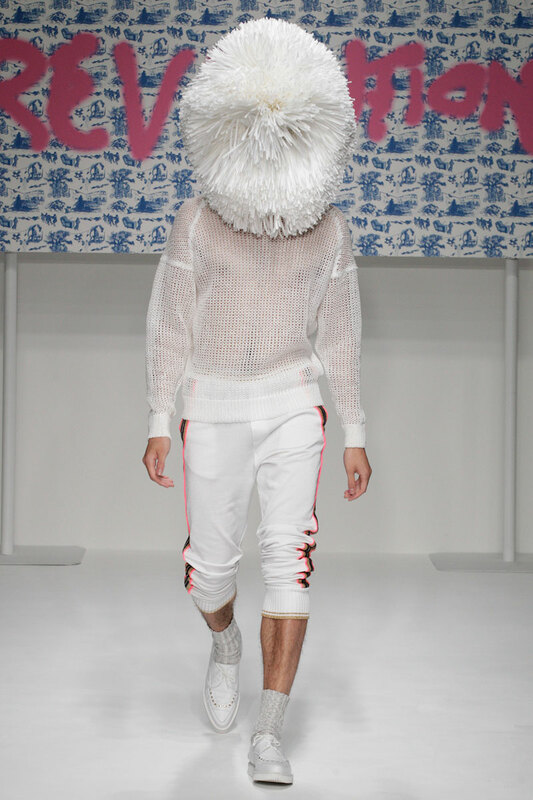 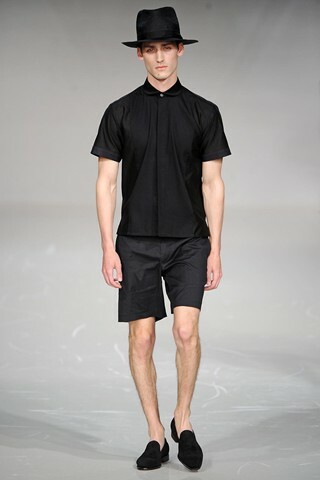 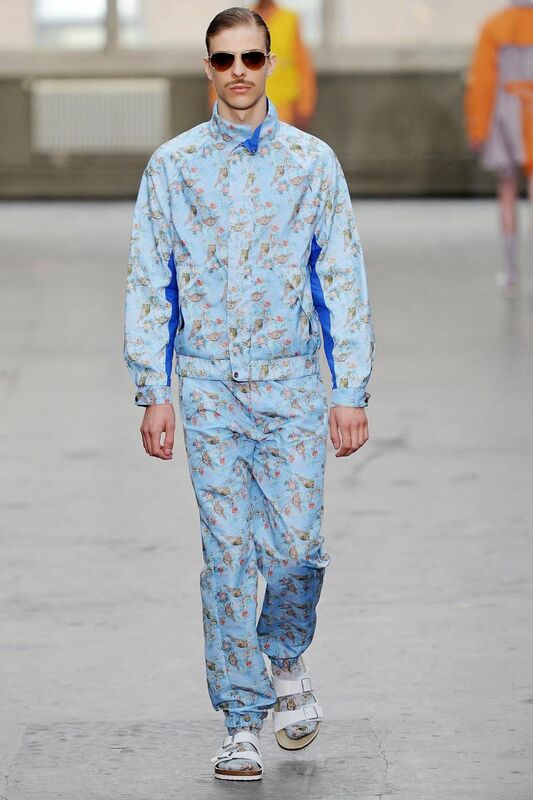 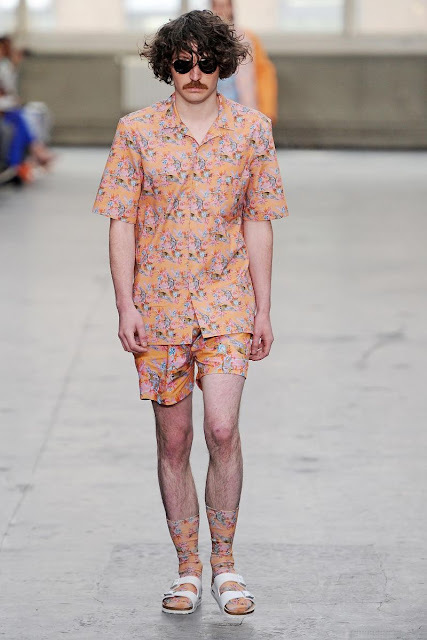 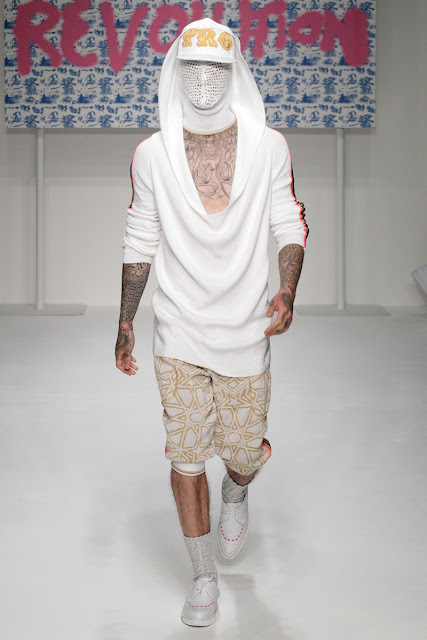 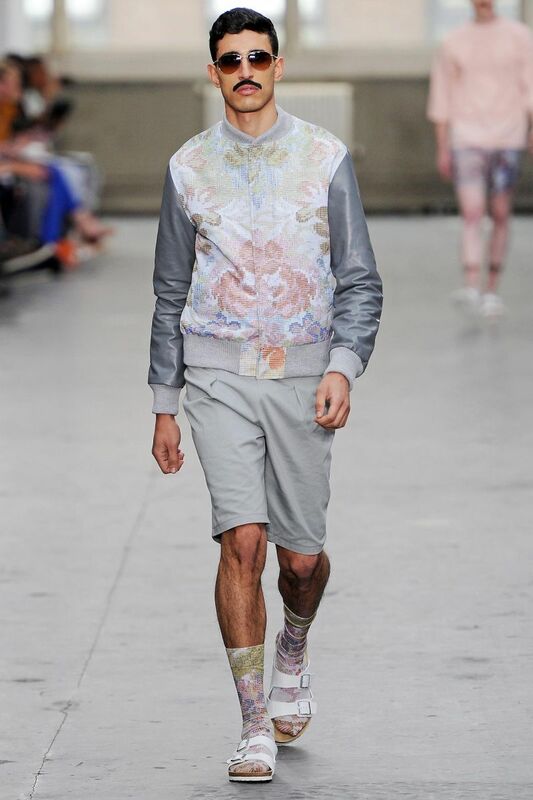 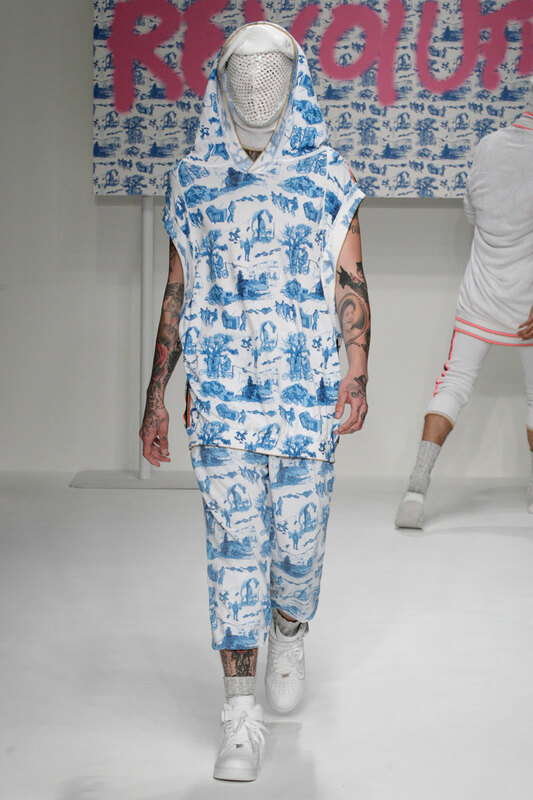 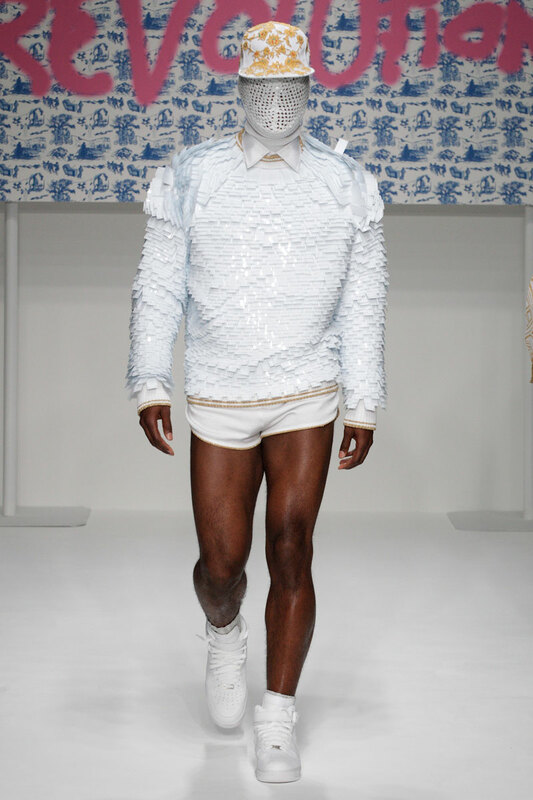 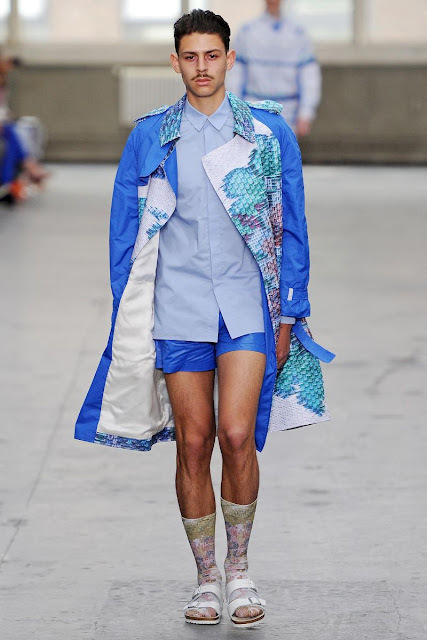 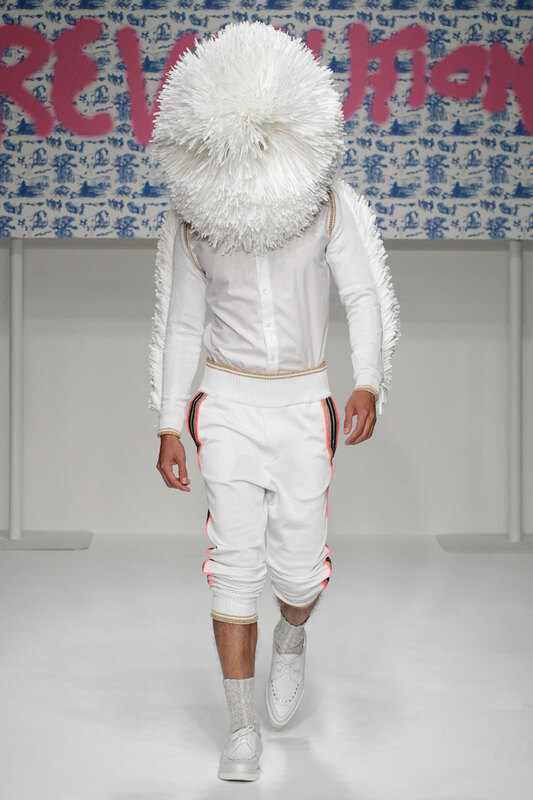 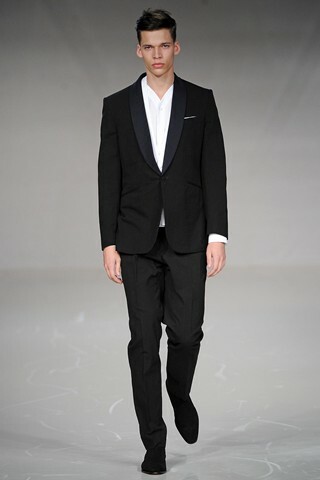 Despite the pressure to produce another successful collection, their inaugural menswear runway show during London Collections: Men did not disappoint the interested audience that turned up early in the morning of 16 June 2012 for the first event of the day. 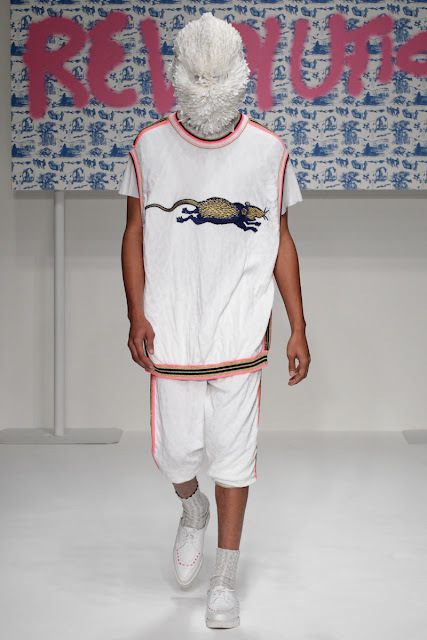 For Spring/Summer 2013, Sibling developed playful subversions of classic knitwear styles (as has been expected of Joe Bates, Sid Bryan and Cozette McCreery, the designers behind the label) that were presented in a highly stylised format by doyenne of London fashion, Katie Grand. Entitled ‘Revolution’, the collection focused on the notion that social turmoil can lead to regenerative change by uniting individuals in a collective mission. This confluence of idealism is achieved on the macro level of societal mores by bringing together the diverse micro levels of eclectic street subcultures through fashion, reflecting the coexistence of diverse ethnic and social groups in world metropolises like London or Tokyo. To mirror the patchwork layers of eclectic urban tribes, the range of clothes proposed by Sibling mixed oversized knitted sleeveless sweatshirts, baseball pants in elegant Arabesque motifs, running shorts layered over leggings, bolero jackets, and outerwear encrusted in giant square sequins. In addition, Sibling’s deviant silhouettes are illustrated in garments such as a distorted t-shirt that becomes a four-sleeved top as a trompe-l’oeil thrown-on cardigan. 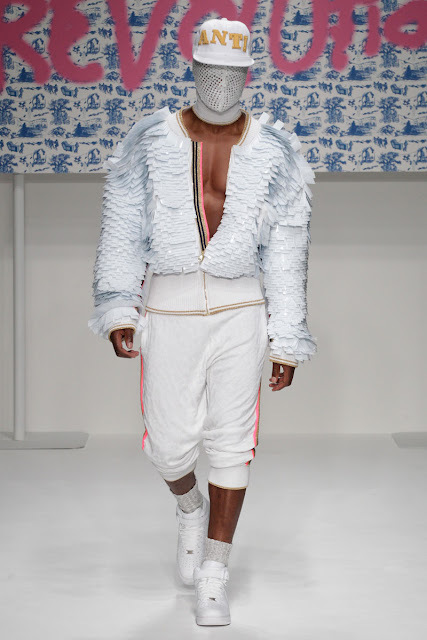 Textures are accented with fluorescent pink tipped with lurex trims, and gold accents are juxtaposed against an all-white palette. 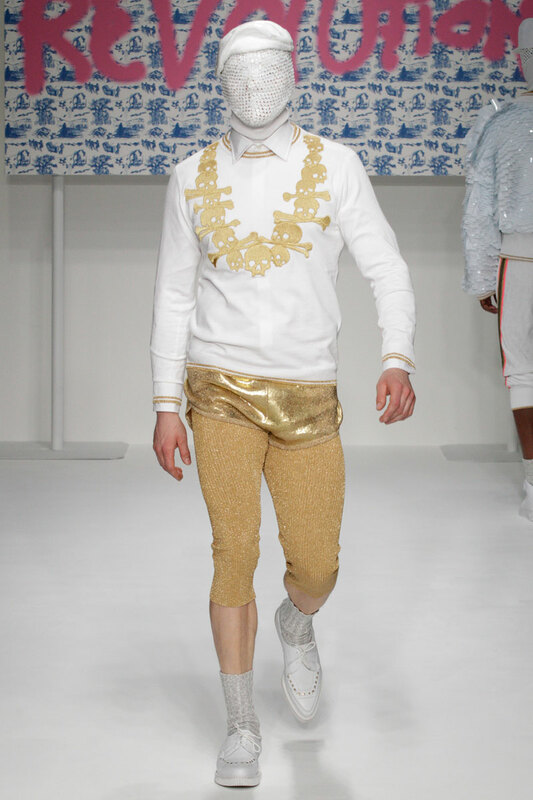 Stylish hats with gold embroidery by Hawthorn & Heaney added a fine touch to the collection. 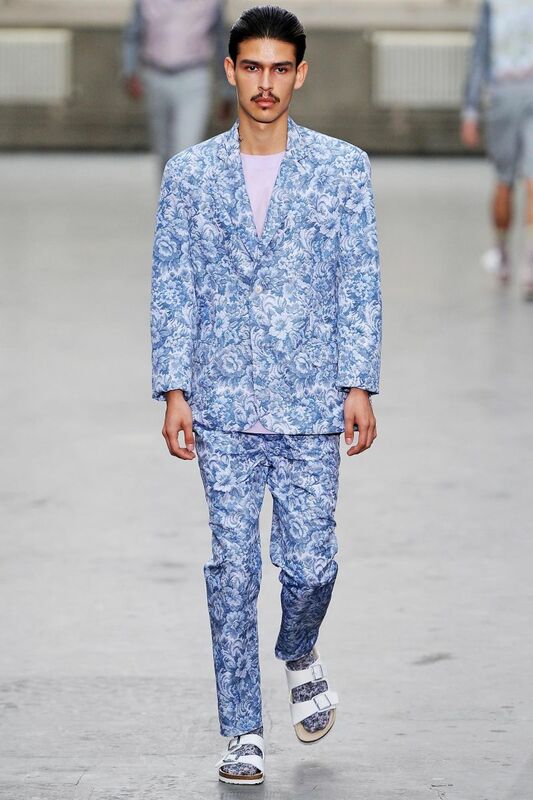 And, to confirm Sibling’s command of sartorial languages (and awareness of high cultures in the history of fashion), Willow-patterned fabrics are introduced into the collection as a way to mix Chinoiserie with sportswear in a highly successful process. Overall, this was an accomplished collection that confirmed, once more, the creative energy that Sibling has been consistently replenishing on the fashion arena in London. 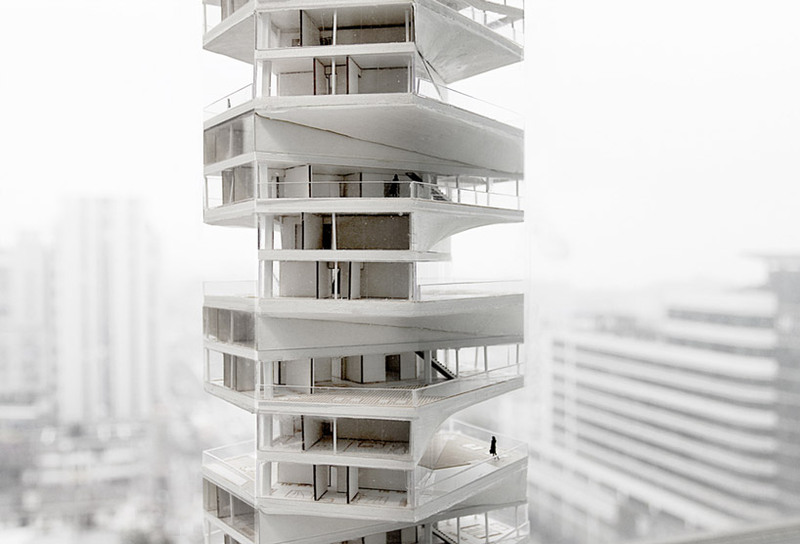 LYCS Architecture, the young architectural practice based In Hangzhou, China, have designed the Writhing Tower, a high-rise residential building in Lima, Peru. 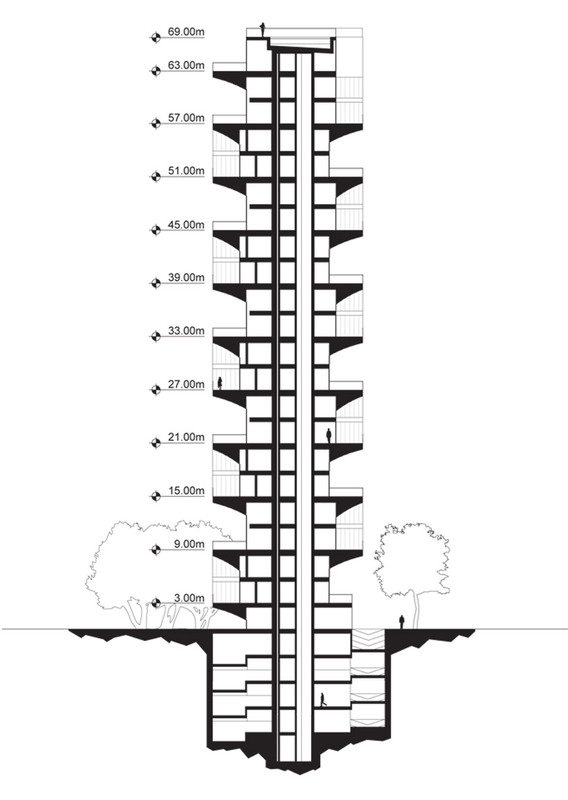 Each luxury residential unit of the building is rotated on a 45 degree angle to create a cruciform shaped plan and to give the appearance of a linear hinged volume. 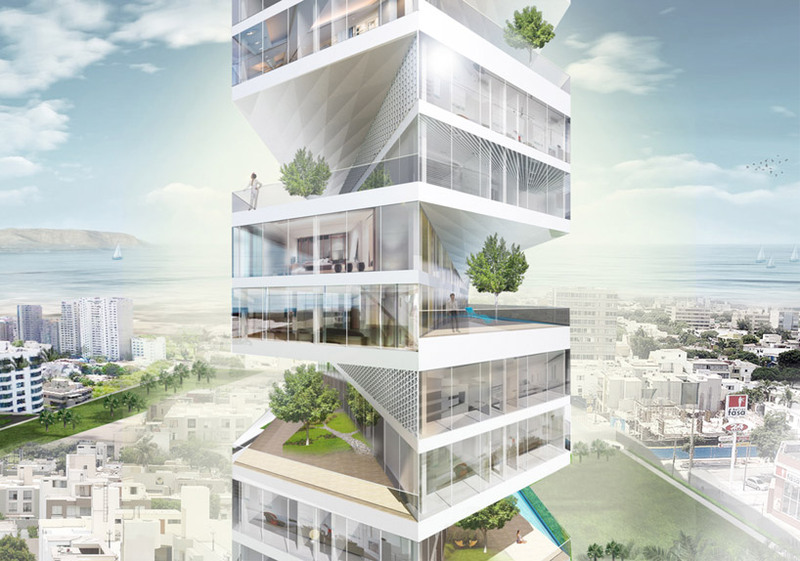 This layout not only block views to the apartments above and below to create privacy, but it also enables each suite to have uninterrupted vistas to the public park at the front of the site and the ocean at the rear. 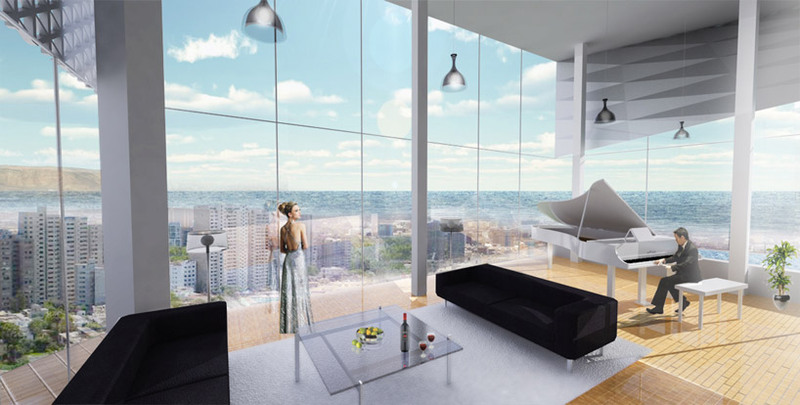 Each suite is a two-story townhouse, with a terrace for a garden and a pool with a deck. 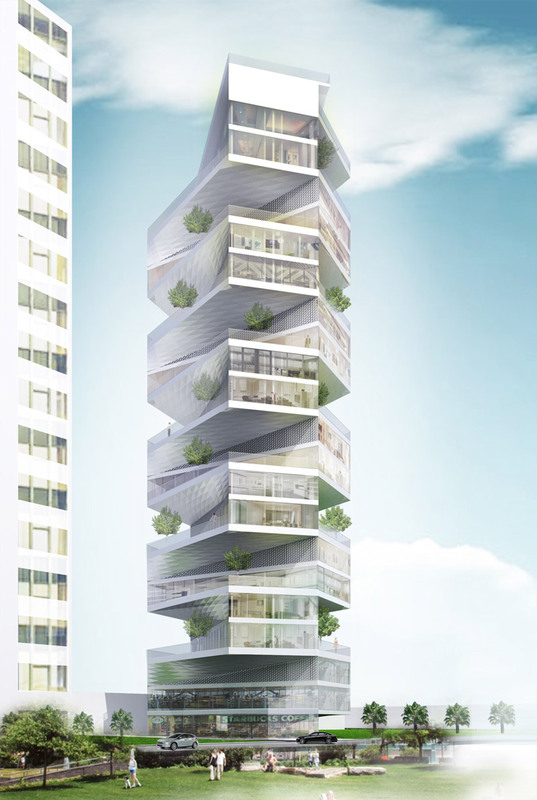 Because of the geometric position of the overall tower, each patio is able to receive tropical sunshine and breeze. The hubris of unfortunate location for a runway show struck Spencer Hart in a harshly symbolical way that, ultimately, ended up mirroring the brand’s disappointing proposal of garments for Spring/Summer 2013. 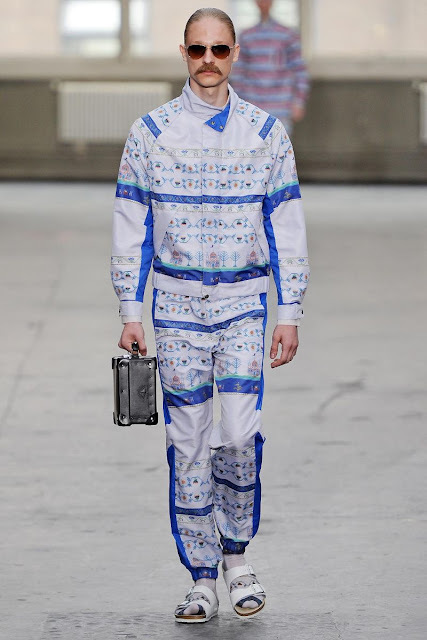 In other words, as guests took their seats to witness the label’s latest menswear collection in the damp and dirty environs of the Old Selfridges Hotel, a collective chilling premonition was felt. 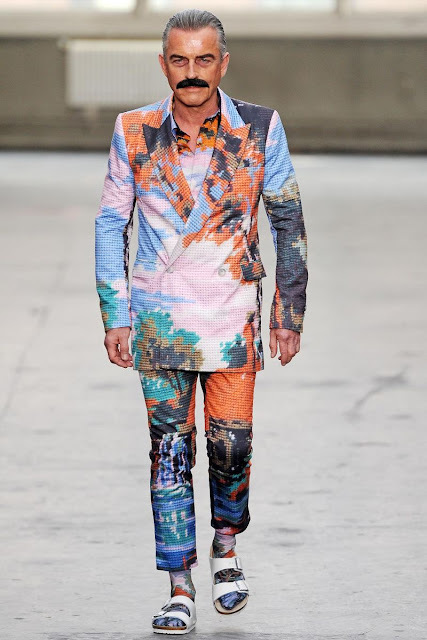 This was not a reaction to the lack of fresh air inside the derelict building site but a fearful forewarning of the unpreparedness of Nick Hart’s sartorial display that was to unravel over the next few minutes. 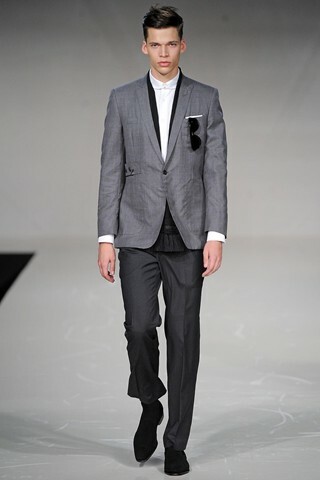 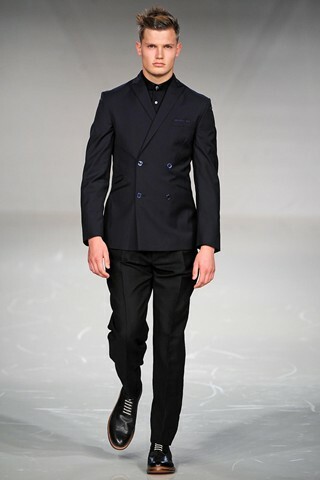 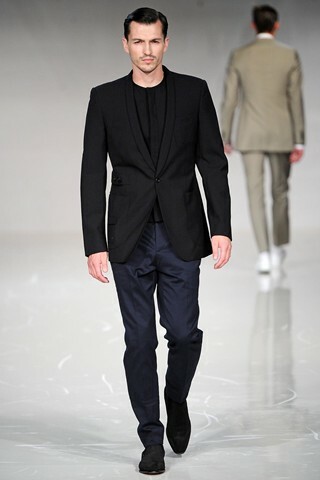 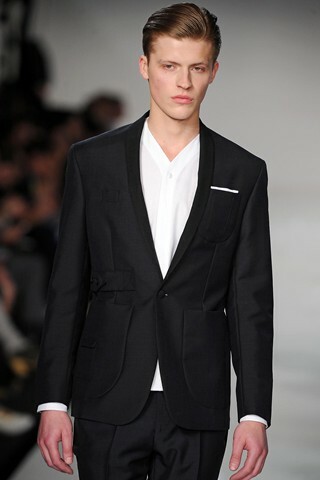 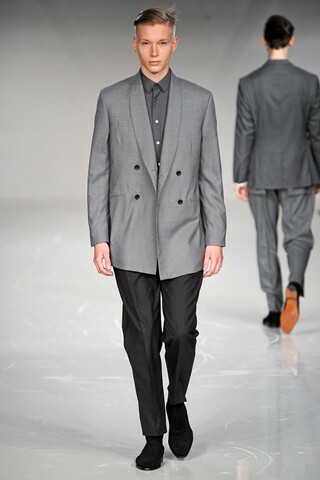 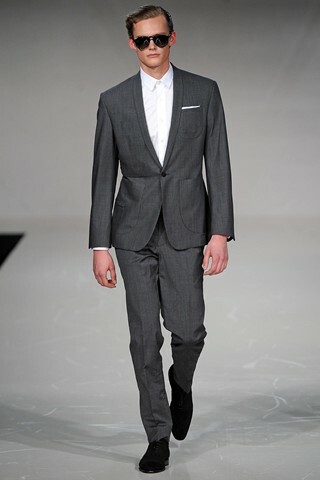 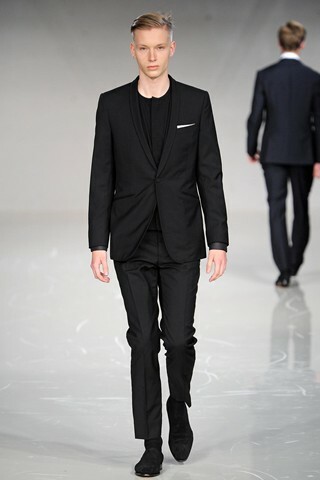 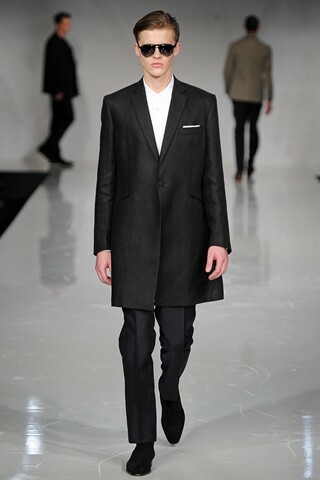 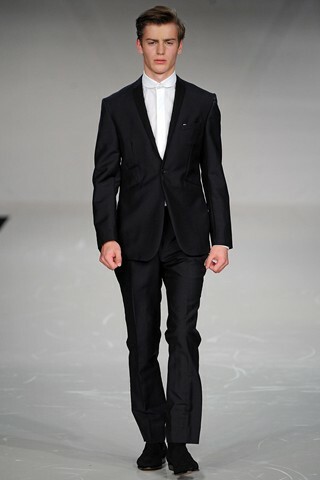 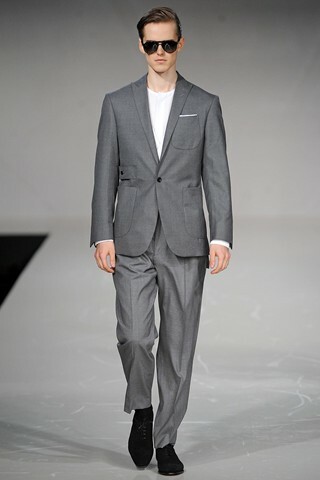 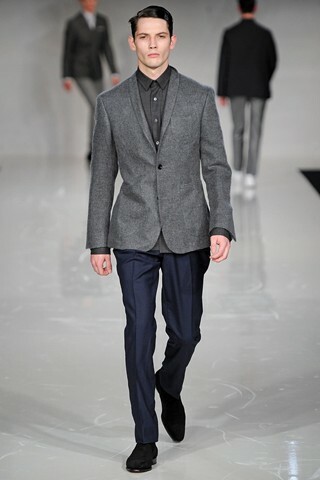 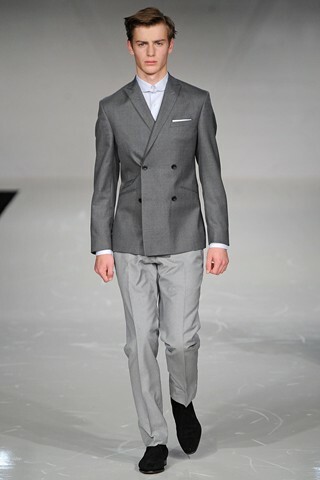 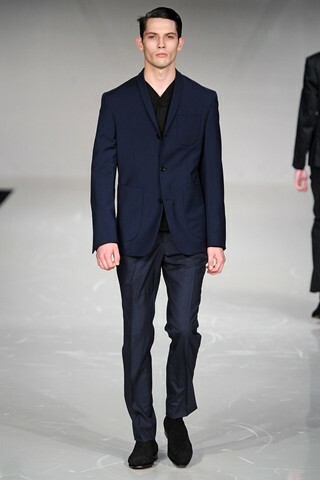 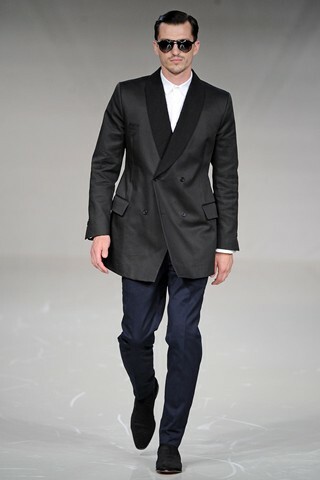 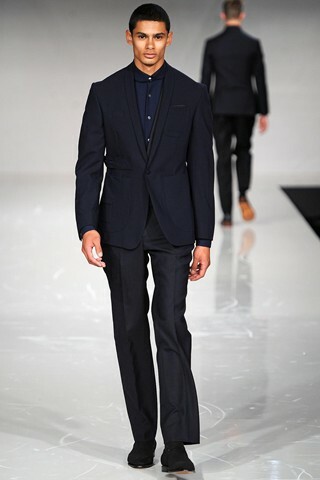 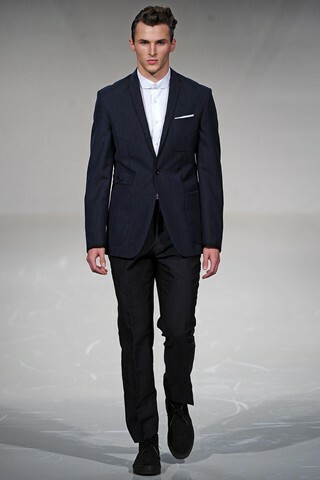 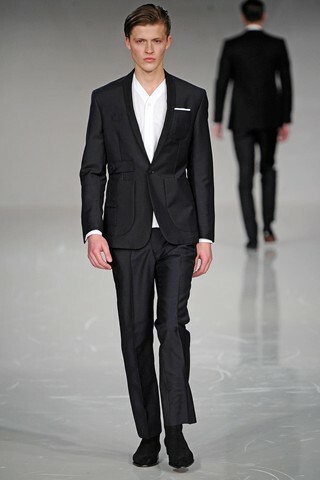 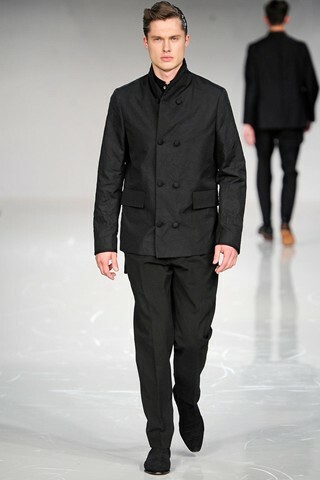 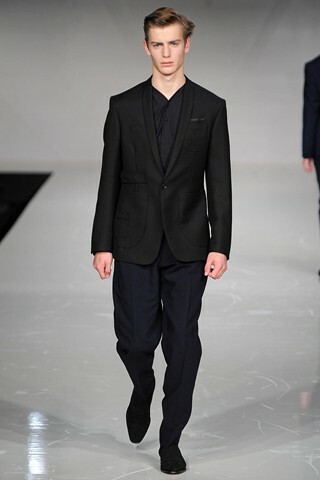 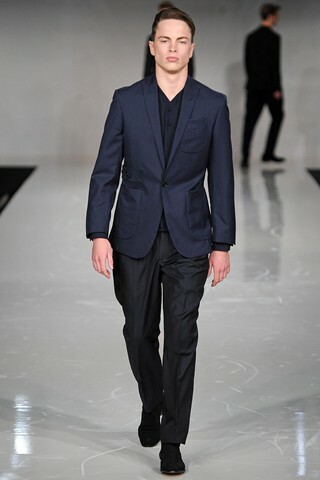 In spite of the ambition to join the calendar of the inaugural London Men’s Fashion Week and confirm his status as one of the most influential tailors and designers in the British capital a decade after the inception of the brand, Hart’s collection suffered from wanting to try too hard to please his audience. 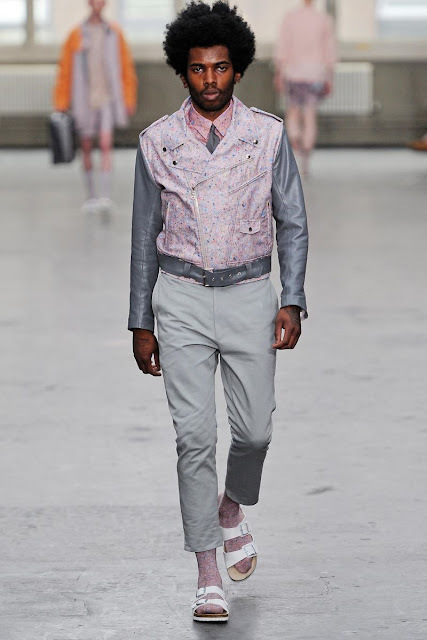 The mood was supposed to be influenced by the exciting and vibrant urban subcultures and individuals or groups such as the Rat Pack, Miles Davis, the Black Panthers, David Bowie, and the British Jazz-Funk Soul scene of the late 1970s and early 1980s. 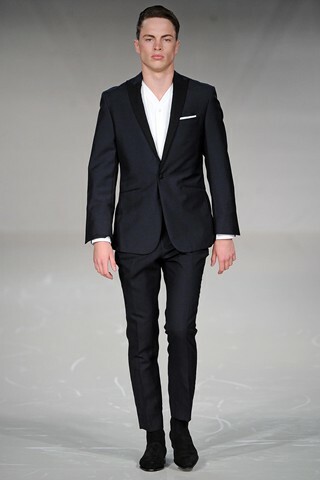 However, the melange of influences was confusingly juxtaposed against the background of a sponsored champagne reception, a performance by a group of dancers, and a display of celebrity endorsement (that included David Gandy on the front row, and Lawrence Dallaglio and Benedict Cumberbatch taking to the runway). 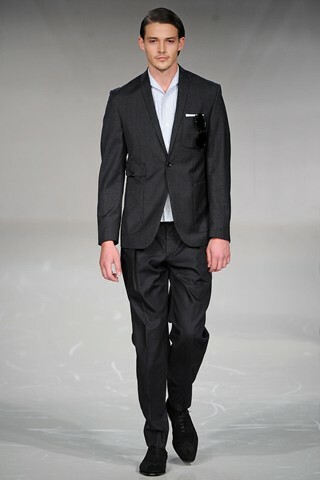 As far as the garments were considered, and in spite of a few elegantly tailored suits and attractive black short-sleeved bib shirts, Hart attempted to mix traditional sartorial forms with more creative details such as multi-layered pockets, patch pockets and buttoned side straps on jackets, and utility pockets in the back of trousers. 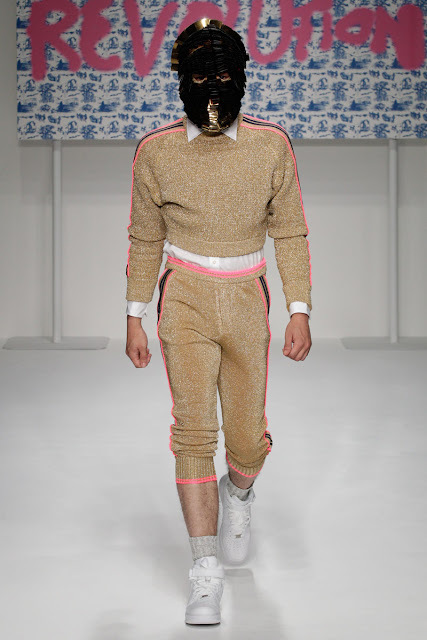 However, this eclectic approach failed to work when the back of tight-fitting jackets stood out in an unflattering manner over the excessive fabric of trouser pockets, when waist lines were virtually destroyed by oversized front patch pockets, or when crinkled fabrics were combined with crisp wool. 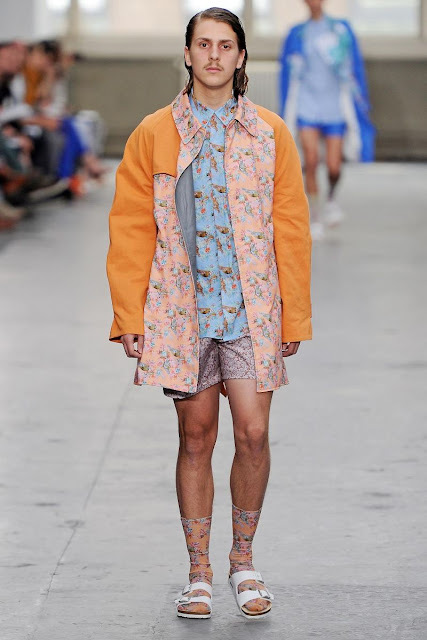 Furthermore, it was highly disappointing to notice the lack of attention to detail on the runway, which included clothes that had not been steamed or ironed, chalk stains on garments, or the leftovers of masking tape with notes for the models. 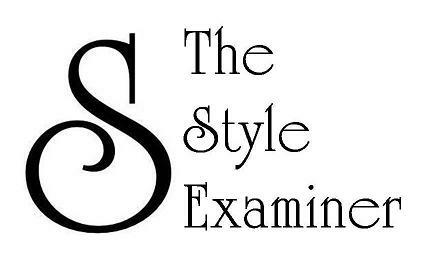 The Style Examiner believes that this might have been a reasonably successful collection if Spencer Hart’s team had focused on choosing the right venue and on editing the runway looks carefully instead of investing in theatrical fireworks and celebrity sightings. 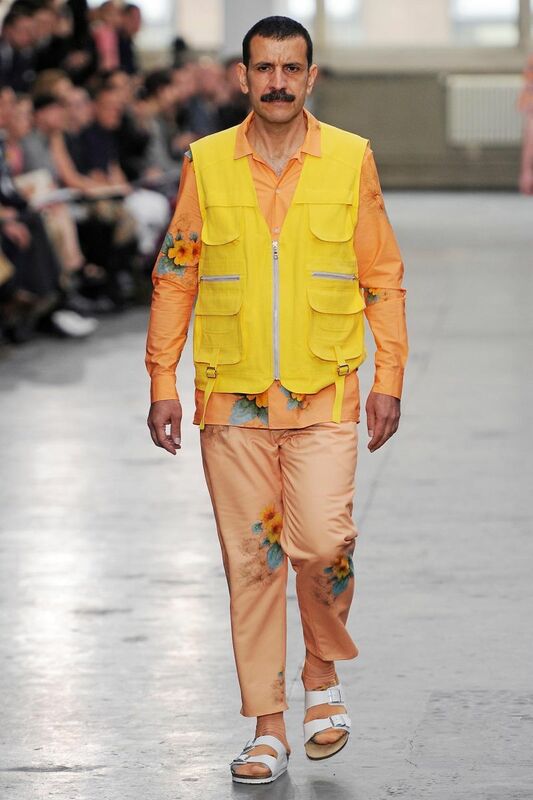 Our guess is that Hart’s audiences will have to wait until the next runway or presentation display to investigate if any lessons have been learnt. Hopefully, the venue will be clean and air-conditioned, and the centre of attention will be the designs and not the celebrities.